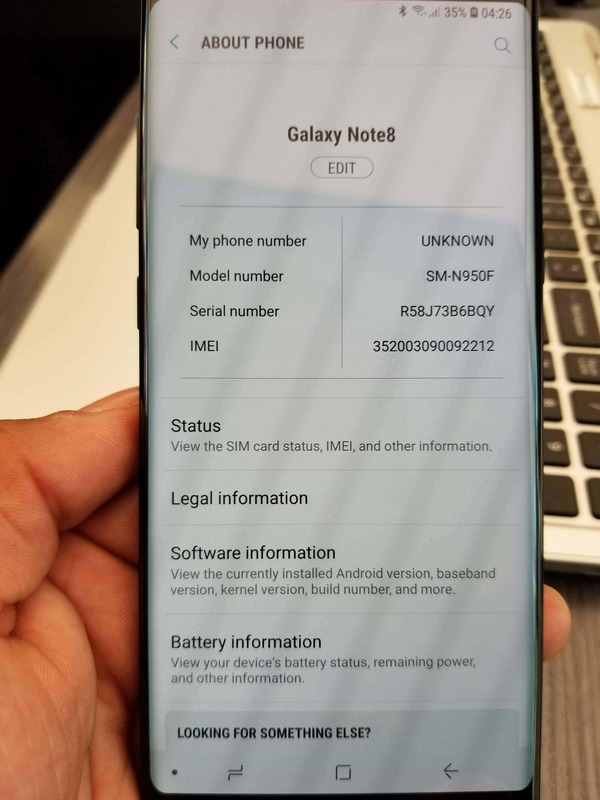 One owner of the Galaxy Note 8 unexpectedly received Android 8.0 Oreo from Samsung earlier this week, having been prompted to upgrade their device to the latest version of Google’s operating system via a notification signifying the arrival of a new over-the-air package. 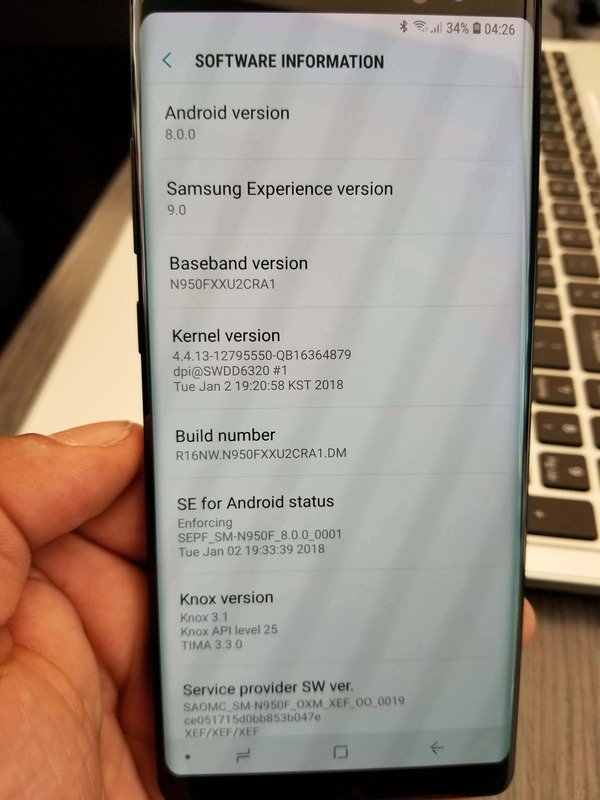 The source provided the two images seen below that depict their Galaxy Note 8 running Android 8.0 Oreo, adding that the device in question is an international model powered by Samsung’s own Exynos 8895 SoC, even though they’re located in the United States where consumers can generally only purchase Snapdragon 835-equipped variants of the phablet. The same person also claims to be a Samsung employee but didn’t have any immediate knowledge of the newly released update. While an unexpected appearance of a major OS upgrade is usually indicative of a soak test, the South Korean phone maker rarely resorts to such experiments and even when it does, it rolls them out in a more transparent manner, i.e. accompanies them with some kind of an announcement. Whether the spotted OTA package suggests Samsung’s mobile software support practices are changing or if it was launched by a mistake remains to be seen, though no other owners of the 2017 phablet have yet claimed to have received the update and provided some evidence to support that. Samsung itself is still in the process of optimizing Android 8.0 Oreo for the Galaxy S8 and Galaxy S8 Plus, having just recently announced its beta test will be concluded on January 15th, and while recent reports suggested Oreo development for the Galaxy Note 8 is already underway, the lack of official comments on the matter indicate a relatively stable build of the new OS may still not be ready for beta testing. Besides a new software build, the OTA package received by the source also contained the January Android security patch which Samsung detailed earlier this week. As is the case with the Galaxy S8 lineup, Android 8.0 Oreo is unlikely to introduce support for Google’s Project Treble to the Galaxy Note 8. Instead, the reworked OS framework designed to facilitate the process of updating devices is only expected to arrive with the Galaxy S9 and Galaxy S9 Plus, as well as other Samsung-made smartphones and tablets running Oreo out of the box. The tech giant’s new pair of flagships is rumored to be announced at MWC 2018 in late February and start retailing around mid-March. The post Samsung Galaxy Note 8 Owner Unexpectedly Receives Android 8.0 appeared first on AndroidHeadlines.com |. You are reading an article on the Samsung Galaxy Note 8 Owner Unexpectedly Receives Android 8.0. All materials on the site Gadgets F, а также и статья Samsung Galaxy Note 8 Owner Unexpectedly Receives Android 8.0 - written for the purpose of information enrichment and we are happy if you like our magazine.